This is probably our liveliest sportfish! Weight for weight, I personally rank it as the hardest fighting freshwater fish in Malaysia! From the sudden thumping strike till the last seconds before it is landed, the sebarau just never gives up fighting the angler! In comparing it to the fish of the temperate climates, I'd say its traits are similar to the rainbow trout. 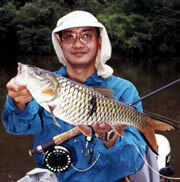 The sebarau readily takes artificial lures with its aggressive character. The habitat too is very similar. It can be found in the larger streams, rivers, old mining ponds with streams running in, lakes and dams. They will lurk around structure in the flowing water. Using the eddies of fallen trees, branches and rocks to wait for passing prey. In still waters, the smaller sebarau can be found in and around shallow weedbeds. However the bigger sebarau will take up residence in deep waters. Areas with submerged tree trunks or fallen logs will produce sizable sebarau that sit in these deep waters. 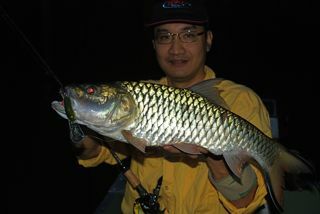 Sebarau up to a kilo give great sport on light casting tackle. Bigger sebarau require heavier tackle especially in snaggy areas. A sebarau over 2 kilos would be regarded as a rewarding catch. Sebarau as big as 5-7 kilos have been caught. 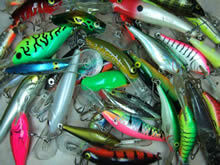 Artificial lures like spoons, soft plastics, spinners, spinnerbaits and minnow profile plugs readily account for most of the sebarau caught. 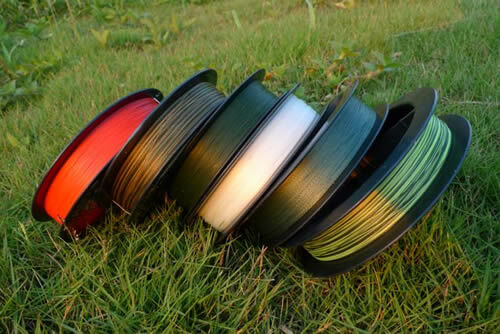 Flies like poppers, clouser minnow and deceivers will work for the fly fisherman. Listed below are links to various sorts of sebarau articles, from technical aspects to stories of sebarau fishing trips. Losing Sebarau - how not to! 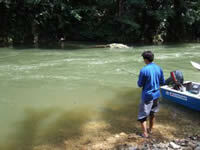 Fly fishing and hard lure fishing for sebarau goes head to head. Which method triumphs! 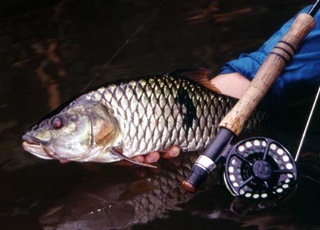 Hampala barbs in Sarawak are known as juak or adong, depending on their colouration. Find out more in this travel article to Borneo Island. Did you know sebarau bite at night?